Challenges vs. Webinars: Which One Should You Do? Should you offer a challenge or a webinar? Which one is better? Which one will lead to the sale? Honestly, they both work, but it totally depends on WHO you serve and HOW you run your business. In this episode we’re defining the main differences between challenge + webinar funnels, offering examples for when you might use both, and asking the questions you need to answer before you begin. Bottom line: It’s not a straight answer. One or the other – or a combination of both – might serve you + your clients best. But listen to this episode before you decide! [3:49] Can I make this challenge evergreen? [9:44] “It worked in theory.” Why you should TEST, and test again. [12:28] Did they just WASTE $10,000 running a challenge? In this episode, we’re going to talk about … should you do challenge funnels or a webinar funnel? This is a question I get asked a lot, as kind of like, “What should be the format of my funnel?,” so I figured I would do an episode on this, because it’s not a straight, easy answer of like, “This one converts better.” I wanted to kind of give you guys scenarios of when you would do each one versus the other. When I say challenge funnels, it means, obviously, if you don’t know, running a free challenge, getting people in the free challenge, and then most likely selling them into your next level offer at the end of the challenge. Webinars, obviously, are getting someone into a webinar and then selling them. What is kind of the best customer journey for people to go through in order to become a buyer? Essentially, because that’s our goal. Here’s some things to keep in mind, because they both work … and this is super important to just know that, because there isn’t a right answer in which one works better, but I wanted you guys to know which one my suggestion would be based on what you’re trying to achieve. Challenge funnels generally give a lot more nurturing and interaction and … [it] allows you to have an opportunity where somebody would actually achieve a micro-result with you during that five-day challenge. or three-day challenge, or whatever you’ve created. Webinars are obviously a lot less interaction, one hour of your time with that person, and so there’s essentially less nurturing. Because a lot of times, and this is not for every single scenario, but a lot of times people in the business-to-business space will be fine with just a webinar and no challenge, and people who are marketing to consumers, especially if you have a health product, weight loss product, something that’s going to consumers, then challenges are a great fit. They need that extra nurturing with you, that extra relationship-building, and a challenge might be a very good option. For example, my husband and I have an online fitness membership site, and we do a challenge, a huge challenge, twice a year to promote the membership. We do it in January, and we do it in the early summer, because those are the best times for the health and weight loss space to be doing a challenge. We run that live, and we don’t keep on running it, because it kind of loses its momentum if we just kept on running it evergreen. It’s a great live way to launch, but you obviously don’t want to be doing that every single month, because the more you do it, the more it essentially loses momentum and purpose and meaning for your following, because they’re like, “Oh, I’ll just join the next one,” or … it just loses its momentum. Webinars you can run all the time. So you can absolutely have an evergreen webinar that’s converting, you can have a live webinar that’s converting, you can do a weekly live webinar. They’re a lot less work to run, because there’s less involved with it. So if your model is that you need to ongoing continually sell, a webinar might be the better option. 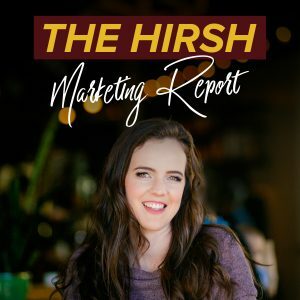 One thing to keep in mind is, if you’re targeting consumers and you’re trying to convert them in a webinar, especially if you’re going to a higher ticket item, you might need to have some built-in earlier nurturing, which is step two in The Hirsh Process of the visibility, because that way you could create that nurturing and extra time that someone’s building a relationship with you before they get into the webinar. That could look like having videos and content directly on Facebook that you promote, and you then re-target those people into your webinar. Essentially, the bottom line is choosing, “How much nurturing does my audience need in order to reach the sale, in order to build to the point of connection and trust with me until they’re ready to buy?” And that really depends on your audience, it depends on your content, it depends how you want to deliver the content, because obviously challenges and webinars deliver it differently. And the thing you want to make sure with challenges is that you don’t give away so much that somebody’s able to take that and then go and apply it, and they don’t need your product. Work your content in so that it’s complementary of your offer, regardless of if it’s a challenge or a webinar. I mean, same applies. It’s just harder to do with a challenge. For example, for our fitness membership challenge, we give all the diet advice and put together a workbook of things that they should be doing, but we don’t give them the workouts. Then our membership site is the workouts. So it’s built in throughout the challenge, and it works super well, because people are talking about the workouts. If you haven’t joined our membership yet, then you kind of have that FOMO. So we’ve built it in so that we’re not giving it all away, and we’re just complementing our product. That’s important with the challenge. Now, really quickly, I’ll talk about doing both, because for a live launch, this actually might be a good format as well, even if you’re in the business-to-business space. Honestly, with challenges, even getting to be with webinars … beginning business owners are the ones who are participating in this. If you’re targeting high-level business owners who are already in the six-, seven-figure range, your strategy is going to come down to having really good direct-on-Facebook, not a lot of loops for people to go through to get to you, type of strategy. Combining them is also a common thing to do, and it can also work very well, regardless of your industry. What this would look like is, you do the challenge, most of your ad spend goes to having people sign up for a challenge, and then at the very end of the challenge, on the last day, you open the doors to whatever your offer is, and you have a webinar at that time. That’s the last piece of your challenge, and that way you’re kind of doing both. Now, the only thing to keep in mind here … It works very well most of the time. It builds the relationship, especially if you do a pop-up Facebook group during the challenge, and you’re building this community, and talking to people, and engaging … and then you do a webinar, and that’s kind of like what opens the cart and pitches to people. It works very well. What you have to keep in mind is, don’t make the challenge so long that people drop off during the challenge and they don’t end up coming to the webinar where you pitch the offer, because the longer you make it and the more content … you don’t want to overwhelm people so [much], where they stop participating, because then you could be losing out on sales. This is something to test. I’ll leave it with that, because … this [next] example I wanted to tie into this episode, because with any marketing advice that I give … and I’ve talked about this before, about “do not do cookie-cutter marketing,” because the thing is, I don’t have the answer for every business owner. Every business that we work with gets a customized strategy. It’s not like, “Oh, here’s the template and magic key,” and you go and implement this. They get a customized strategy, because their audience is different, their offering is different, the way their audience responds to their offerings and their content is different. At the end of the day, you can test these things and you can compare them. You could do a launch with a challenge, and then you could do a launch with a webinar, and you could do a launch with both, and you could compare numbers. One of my clients really felt like their ideal audience needed to have all the nurturing in the challenge and then go to a webinar. They came to us with this strategy already kind of laid out and their funnel done. We were going to run ads for their live launch. I was like, “Great.” It seemed like no red flags in the strategy at all. They had quite a big budget. It was over $30,000. We put majority of that budget into getting people signed up for the challenge. But because they wanted to go into this live launch, and then basically turn it evergreen, evergreen webinar, it would be like, ongoing pitching their course … they didn’t have an open and close doors. So they only opened the course to people who attended the webinar, which made sense because that allowed us to continually get traffic into the webinar and then their course. What happened is, the challenge did great. We hit our goals of getting number of challenge registrants. Then when it came time to start promoting the webinar, we only were promoting it to challenge registrants at that point, because that was the strategy. I agreed on it. In theory, it was going to be a good strategy. That’s something I would recommend. But what happened is after probably about a week, basically the challenge registrants … We got a lot of sales, and a portion of the challenge registrants signed up for sales, but I would say it was like 25% of them signed up for the webinar … Sorry, not sales. 25% of the challenge registrants didn’t buy, that would be insane! They signed up for the webinar. Then we had these other 75% of people that either had stopped engaging, they got some results from the challenge, they didn’t want to sign up for the webinar, they didn’t see the value in it. And we had already paid for those leads, so what we did at that point was like, “Let’s just try and open the webinar up to cold traffic and just try and get cold traffic in the webinar and see what happens.” We did that, and it started converting, which is actually pretty rare, and it means that the client’s webinar was super good, and they also weren’t pitching to crazy high ticket. It was a $1,000 product. You can convert cold traffic, if it’s a really good webinar and a needed product, in your webinar. But again, customize your marketing plan, because some people can’t do that, some people struggle with that. These guys could. Essentially, what we learned is that we didn’t need that challenge. 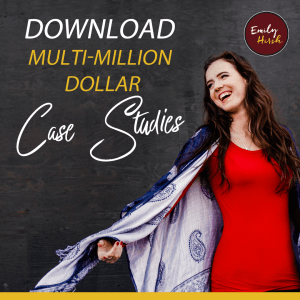 We could have just run all the traffic, put all this ad spend into the webinar itself, and gotten our sales and saved the money that we put into the challenge, because their webinar was so good, and their product was so needed, we didn’t need the extra loop and the extra step of the challenge. Remember that there is no magic formula of which one should you do. The questioning factor is how much nurturing do you want to give, how do you want to deliver your content during your launch … Is it Evergreen ongoing, or is it a live launch? And then you test. Then you do both, because you don’t know until you do. You don’t know how … So many factors, how it’s going to convert, how people are going to sign up, what content your audience is going to be more attracted to, how they’re going to engage with you, how they need to be nurtured, all those things. At the end of the day, I don’t have the secret answer unless you test it, and there’s always value in testing. That is my answer on challenge versus webinar funnels, and if you guys want help with your strategy, deciding which one to do, or even analyzing results on things you’ve done in the past and seeing which one is the best kind of option, go to HelpMyStrategy.com and book in a call with the Hirsh team.